The two rockets for the Twin Rockets to Investigate Cusp Electrodynamics, or TRICE-2, are in the launch position during a dress rehearsal at the Andøya Space Center in Norway, Dec. 1, 2018. The two NASA Black Brant XII sounding rockets are encased in an insulation foam to keep the motors and payload warm. The launch window for TRICE-2 is Dec. 4–19, 2018. TRICE-2 is one of nine missions for the Grand Challenge Initiative – Cusp, an international collaboration to explore the northern polar cusp – where Earth’s magnetic field lines bend down to meet the poles and particles from space can enter our atmosphere. In early December, observers in northern Norway will be treated to an unusual show: a sounding rocket double feature. Arcing up over the Norwegian sea, the first rocket will blast off to an altitude of more than 600 miles high, headed due north. Approximately two minutes later, at a lower altitude, another rocket will follow its path. These twin rockets are chasing down a mystery about magnetic reconnection, the explosive process that allows charged particles from space to stream into Earth’s atmosphere. Carefully observing anomalies in this stream of particles, scientists have wondered about the processes that let them in: Does magnetic reconnection turn on and off, like a faucet, or do particles course in from separate locations, like the distinct streams of a sprinkler? Armed with two rockets and a clever experimental design, the scientists behind the TRICE-2 mission, short for Twin Rockets to Investigate Cusp Electrodynamics-2, hope to uncover an answer. The results promise to shed light on the fundamental process of magnetic reconnection and, in the long run, help us better predict how and when Earth’s magnetic shield can suddenly become porous and let outside particles in. Animation showing Earth’s magnetosphere as it interacts with the solar wind. Earth is surrounded by a magnetosphere, a giant magnetic shield created by the churning of liquid iron deep inside the planet. Our magnetosphere is what stands between us and a steady rain of electrically charged ions and electrons streaming from the Sun, known as the solar wind. For the most part, it holds strong. But occasionally, it gives way. “When the solar wind encounters Earth, the energy and field lines of the Sun’s magnetic field can connect up with those of Earth,” said Craig Kletzing, a physicist at the University of Iowa in Iowa City and TRICE-2’s principal investigator. 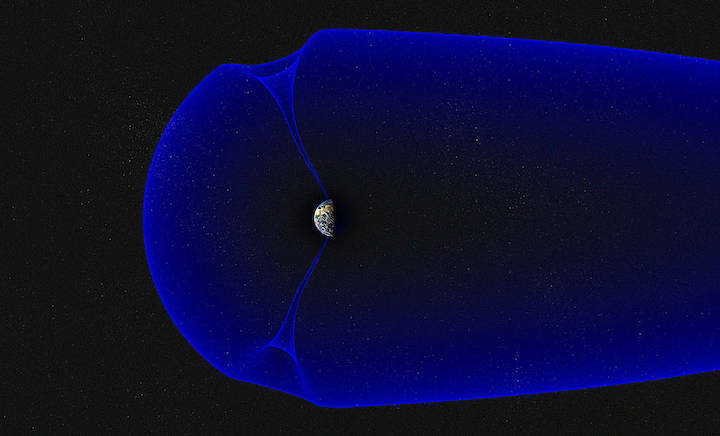 The magnetic reconnection process creates a bridge between the solar wind and Earth, allowing ions and electrons from the Sun to stream directly into Earth’s atmosphere via a region known as the polar cusp. Earth’s magnetosphere, showing the northern and southern polar cusps. The polar cusp is a weak spot in our magnetic bubble — but it’s also a place to investigate magnetic reconnection processes that occurred in otherwise difficult-to-access regions of Earth’s magnetosphere. Researchers have measured the solar wind ions that pour in through the cusp for clues about magnetic reconnection processes that allow entry. But so far, a puzzling feature of these ions remains unexplained. As solar wind ions race along the newly reconnected magnetic field lines, they spread themselves out like runners in a marathon. The fastest-moving ions move to the front of the pack, overtaking those moving at slower speeds. Slower-moving ions gradually fall behind. In theory, this process should create a constant, unbroken stream of particles, smoothly varying by energy levels: the highest energy ions reach Earth first, followed by slower and slower ions behind them. But when spacecraft have measured the ions that pour in, they don’t find such a smooth, unbroken stream — instead, they find abrupt transitions from high to low energies. Puzzled by these results, scientists developed two models of magnetic reconnection that might produce them. The first model suggests that magnetic reconnection varies in time, like a faucet being turned on and off. The abrupt changes, or steps, in the data are produced because the faucet switches from on to off and vice versa, releasing particles in short spurts. “The other possibility is that we’re seeing four or five different places where reconnection is happening,” said Kletzing. According to this model, the steps are the result of the spacecraft passing through different magnetic reconnection events, like a finger running along the separate streams of a sprinkler. As your finger passes through one stream and abruptly enters a new one, you feel a sudden change — a step in the data. The TRICE-2 team designed their mission to differentiate these two models. The key difference between them, they reasoned, is whether the observations should change over time. If reconnection is turning on and off like a faucet, the specific pattern of steps you observed should be changing all the time. “If you flew through a minute or two later, the whole pattern would be different,” said Kletzing. To distinguish between these two models, the TRICE-2 team will fly two rockets that will traverse the same path, approximately two minutes apart. They will be measuring the ions in the atmosphere, looking out for the steps, or abrupt changes, in ion energy levels. If the two rockets detect the steps in the same, fixed locations, that suggests they are passing through different reconnection events, and reconnection is more like a sprinkler. If they don’t observe the same steps in the same location, the faucet must be turning on and off — reconnection is changing over time. For the TRICE-2 mission, aligning the trajectories of their two rockets is especially important to their mission. So the TRICE-2 team will use sounding rockets, sub-orbital spacecraft that make short, targeted flights into space before falling back down to Earth. Sounding rockets can be timed and aimed precisely, adjusting their launch directions at a moment’s notice to accommodate local winds and weather conditions. The TRICE-2 mission is one of nine sounding rocket missions taking part in the Grand Challenge Initiative – Cusp, an international collaboration to explore the northern polar cusp. 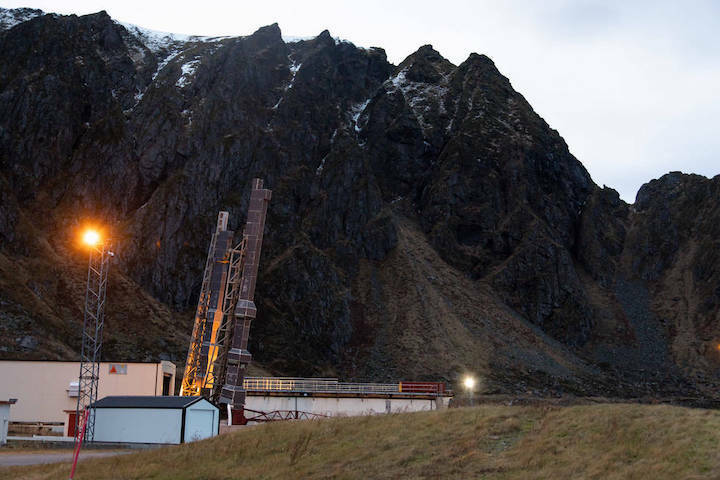 Over the next 13 months, researchers from the United States, Canada, Norway, the UK and Japan will fly their rockets from the rocket ranges at the Andoya Space Center and Ny-Ålesund, Svalbard to unravel the mysteries of this place where Earth meets space. The TRICE-2 mission will launch from Andoya Space Center in Andenes, Norway. The launch window extends from Dec. 4, 2018, to Dec. 19, 2018.